Part of the former International Broadcast Centre at the Queen Elizabeth Olympic Park in London has been transformed into the new home of BT Sport with state-of-the-art production and broadcasting systems for BTs new television broadcast operations. BT sport is a broadcasting station with 24-7 operational capability so equipment reliability is crucial to ensure instant and reliable delivery of critical digital assets throughout the extensive production facility. An iconic sporting backdrop for BT Sport, BTs tenancy of the former IBC building is part of the legacy of Londons Olympic Park. The new studios are the production hub for BT Sport 1 and BT Sport 2 transmitting a host of sporting coverage, including live action from the Barclays Premier, FA Cup, Scottish Premier and UEFA Europa Leagues, supplemented by premier football from Germany, Italy, France, Brazil, Australia and the USA. BT Sport has developed rapidly as both broadcaster and TV brand. Less than two years ago the organisation did not exist, but is now a fully-fledged and respected sports channel boasting viewing figures in excess of 1.3 million. It recently acquired ESPN, another dedicated sports channel, which is also broadcast from the IBC. The master control room manages over 150 incoming and outgoing HD vision lines as well as inbound satellite traffic from BTs Madley earth station, one of Europes biggest satellite earth stations, making the BT Sport Production Hub one of the most connected buildings in Europe. 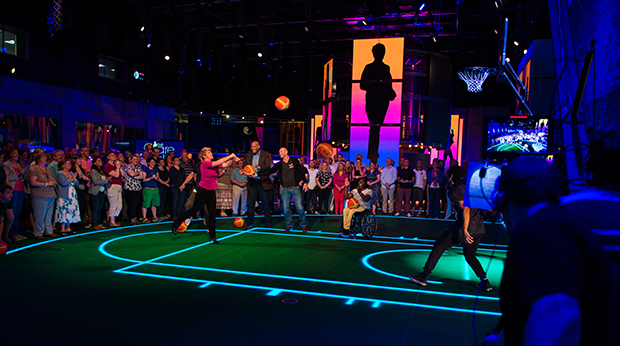 Timeline Television, a leading provider of post-production, outside broadcast and studio-based facilities for every major UK network, was selected by BT Sport to lead on the transformation programme. The company, in conjunction with a technical installation team from Megahertz, built and integrated a full broadcast facility in record-breaking period of 8 months to meet the launch deadline: achieving one of the largest and quickest broadcast installations in the industry. The centre houses three large flexible TV studios, sports production galleries, a master control room, 20 edit suites, dubbing theatres and an audience holding area. Paramount to the tapeless workflow in the centre is the ability to connect any user, anywhere in the building to any service or application running on machines in the central apparatus room (CAR). From the outset of the project BT Sport was clear on their overall objectives, explained Ian Martin, Broadcast Solution Consultant for AIT partnership group. The aim was to deploy a system that would allow complete flexibility to interconnect hundreds of workstations throughout the building to banks of remotely-located electronic equipment; so that edit suites, galleries and office spaces could operate without needing to install noisy and heat-producing equipment locally. Any workstation has to be able to connect to any source device; under user control but subject to administrator restrictions. This level of connectivity allows production teams to use any of the available edit suites by instantly connecting the suites workstations to their specific servers. Pre-configured and stored connection paths allow the production teams to move suites from day-to-day, instantly connecting to their data servers with no interruption to their work. With the imminent arrival of 4K broadcasting and with 8K expected in the future the system has to be ready to handle those formats, all with no video latency; a parameter that is crucial within the broadcasting industry. To achieve this objective, IHSE KVM matrix switches provide the critical central data switching functionality throughout the building. They were selected after extensive technical evaluation by combined engineering teams. IHSEs combination of high video resolution, low latency and instant switching, combined with comprehensive interfacing to studio control systems and stored configuration capability made it the ideal choice, said Ian Martin. Its modular construction and upgradability cover the requirement for future growth within the broadcast centre and the adoption of new 4K and 8K formats. Two IHSE Draco tera KVM switches, each with 288 ports, connect editors, designers and production staff to the banks of Avid editing machines, Omneon storage devices, EVS servers, Chryon production tools and the host of other essential broadcast components physically located in the central apparatus room. They provide the required delay-free switching between sources and workstations to create an end-to-end tapeless workflow; 32 ports of ingest allow immediate access to incoming feeds in any of the 20 edit suites or on any of the 200 producer desktops. IP Director logging stations allow live feeds and rushes to be tagged with appropriate keywords and metadata. Production staff can browse the archive and live feeds, make playlists and send the content to a variety of destinations including the high end edit suites for finishing, TX for play-out, distribution partners or archive. In addition to the edit suites, there are eight voiceover booths, a dubbing theatre and a QC suite. NEC P-Series professional monitors were selected by Timeline to complement the switching system and are used throughout the complex to provide the visual interface to users. Large format LCD displays and desktop screens were installed in the edit suites, galleries and the engineering support room; they are also mounted on the monitor stacks in the master control room where mission-critical performance is essential. Locating the servers and computers in the CAR yields a number of significant benefits. Centralising computers in a controlled environment maximises reliability and security and aids access for IT management as well as preventing unauthorised copying of files by means of USB flash memory devices. Divorcing the computer from the user workstation means a computer can be configured and assigned to a specific task and made available as needed by a user, rather than providing the same application to several users for intermittent use alongside other programs. Studios and edit suites can be built for general purpose use, rather than designated to a specific task or project. The application and content effectively follows the user around; which means that a studio or edit suite can be used by any user, allowing the business to operate more flexibly and efficiently. The tight installation schedule meant that there was very little time to work and absolutely no room for error. Any changes in the specification of the system had to be accommodated. 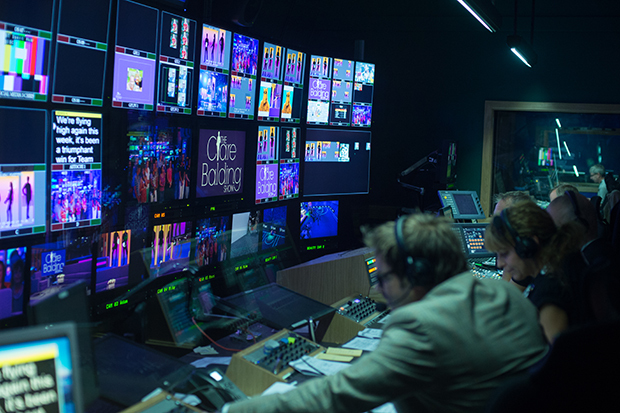 KVM equipment selection, procurement, configuration and integration to the point of live broadcast was completed in just seven months, explains Hugh Pollard, Timeline TV. The route recommended by IHSE was to individually configure individual components prior to installation in the CAR. Flex-port technology in the Draco tera allowed us to set any port as an input or output and then disconnect the extender cards. When reinstalled later in its final location, the switch automatically identifies the equipment and reconnects. So we were effectively integrating the full system whilst the floor was still being laid. Simple connection between the two Draco tera chassis to form one large, virtual matrix also provided additional functionality to the system. As with any large project, devices were substituted during the build phase and we had to respond immediately. The modular architecture and total flexibility of the Draco tera allows us to switch between signal formats, add dual- and triple-head equipment in place of single-head and integrate peripheral devices such as touch screen controllers over USB. Single- and dual-link DVI video signals are generally used within the studios and supported by USB interfaces and digital audio; however a special design to handle some specific VGA-only equipment was also completed by IHSE within the timescale. Scene Double, IHSEs UK distributor, provided technical and integration support to the project teams. Ray Gordon, managing director of Scene Double highlighted the complexity of the installation: This is one of the largest single-system installations of the IHSE Draco tera switch in the world. When we were planning the system architecture for BT Sport, we were confident that the teras inherent scalability and functionality would allow us to achieve a solution that would work immediately and provide a growth path in the future. The excellent system engineering capability and commitment of the integration teams, coupled with the flexibility and capability of the Draco tera contributed in equal measure to the success of the project. The entire tapeless system is mirrored at a standalone BT disaster recovery site where another Draco tera KVM switch is deployed. Future enhancements will include the addition of new broadcast equipment as necessary and the interconnection of the switches together using the new Matrix Grid software to create a single, larger, virtual matrix that will allow operators to reach across the boundaries of the individual switches. The Draco tera KVM switch was one of the crucial elements that enabled BT Sport to meet the tight timescale to launch a bouquet of new TV broadcast channels; on time and with a complete set of features. The original project specification was met in full and additional requirements and changes to the specification were accommodated with ease. At the core of our new studio build is a spirit of collaboration that brings the best of industry working together toward a common aim: to make the BT Sport studios a world-class hub for the best ideas and talent. Jamie Hindhaugh, Chief Operating Officer of BT Sport.